“Rainbow sprinkles are just the best. They’re the confetti of the food world! It’s undeniable that there’s something a little magic mixed in with the food coloring and sugar. The bright colors are instant happiness and it’s practically impossible eat sprinkles with a frown. They also happen to be conveniently delicious on top of one of my favorite things: ICE CREAM. 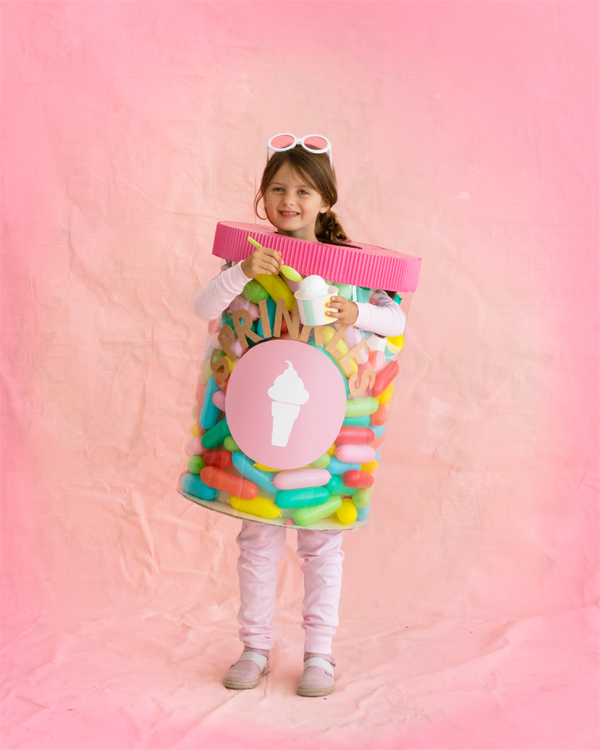 This costume is most definitely inspired by a recent visit to an ice cream shop, where all my will power disappears. The nostalgia that goes with a giant scoop of vanilla ice cream, fully loaded, with rainbow sprinkles is just too irresistible. 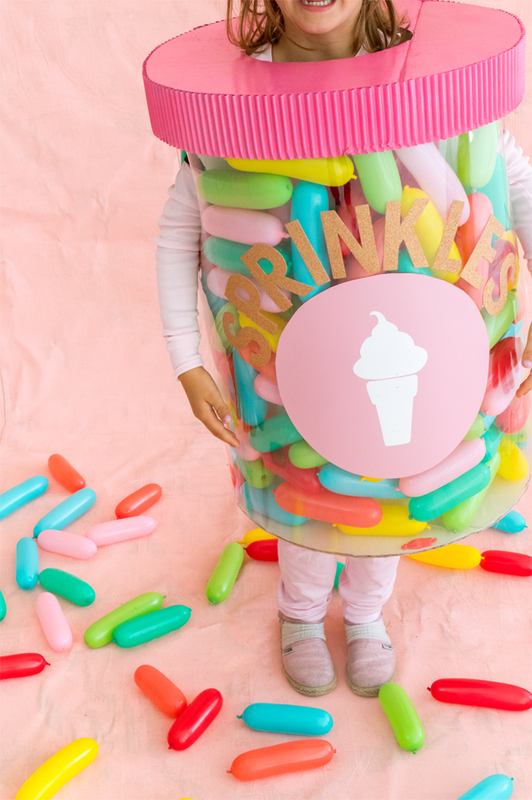 When thinking about how sprinkles would work as a stand-alone costume, I thought that a jar of sprinkles would be the best place to start. Coincidentally around the same time, Jordan had also recently posted an amazing balloon wall photo backdrop with all kinds of awesome balloon shapes and colors. In particular the small hot-dog shaped balloons stood out because they looked exactly like giant sprinkles! The planets were aligning and the last bit of the puzzle was how we were going to make a clear jar. As I’m sure all of you know, when you’re working on a creative project, you see the world with different eyes. Same is true when you’re trying to figure out a Halloween costume! So I did what I always do when I need a little inspiration: I went to the dollar store. I ended up finding a double walled tumbler and that’s what directly inspired the jar construction. Like a double walled tumbler, we just needed to find a rigid plastic material to go around the solid inner tube of the costume to hold the sprinkle balloons. A quick search online produced an affordable and perfect option: clear bannister plastic. 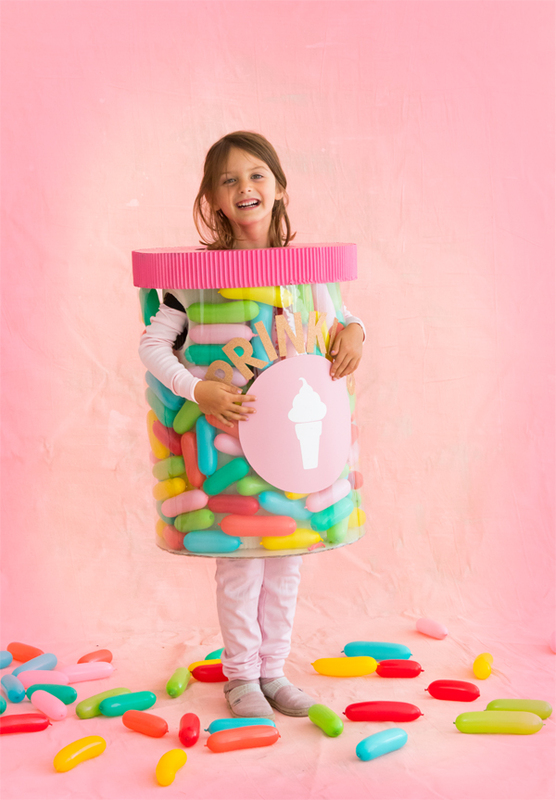 In any event, the moral of the story is that the creative process takes funny turns sometimes and life’s too short to pass on sprinkles! Step 1: Cut two pieces of corrugated paper long enough to comfortably fit around the wearer like a tube. Combine to make one taller tube by taping the two pieces together with gaffers tape. Then, cut holes for arms. Step 2: Cut two long pieces of canvas webbing. Using the wearer for reference, glue the straps to the interior of the tube. Step 3: Trace the opening of the tube onto a large piece of cardboard. Draw a larger circle around the first, 4” wider on all sides. Cut out, then use the finished shape to cut a second, identical piece. The finished shapes should look like a donut. Step 4: Glue one of the cardboard donuts to one end of the corrugated tube. Spray paint white. Step 5: Roll out the plastic sheet on a big, clean workspace. Glue the plastic around the the outer rim of the donut shape. Overlap and hot glue the ends together and hold in place until cool. Trim the top of the plastic tube to about an inch taller than the inner cardboard. Carefully cut arm holes from the plastic tube using an x-acto knife and a pair of good scissors. Step 6: Cut a long piece of corrugated cardboard 3” wide. Glue to the outer rim of the remaining cardboard donut. Then, spray paint the exterior pink. Step 7: Cut a big circle out of a piece of pink cardstock. 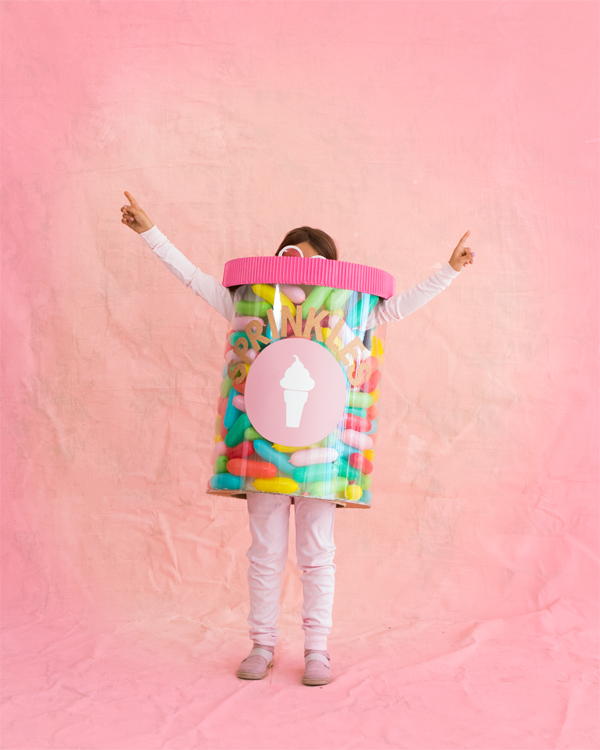 Draw and cut out the silhouette of an ice cream cone from white cardstock. 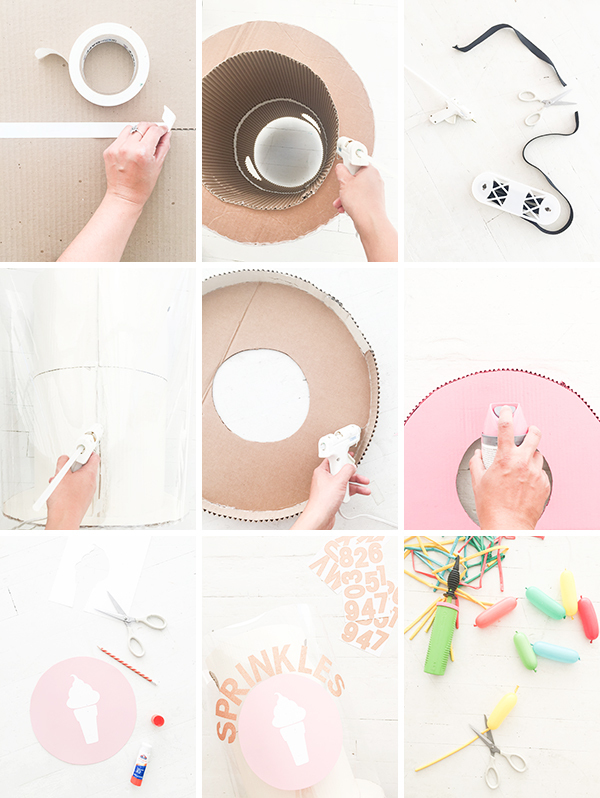 Glue the cone to the circle and affix the logo to the center of the jar. Spell “sprinkles” with adhesive letters along the outer edge. Your jar is all finished! Step 8: On Halloween day, inflate your sprinkles by blowing up the balloons 7” long. Knot off both ends and trim off the leftovers. Repeat until you have enough sprinkles to fill the walls of the jar! This is cute AND hilarious, I love it! GAHHHHHH!!!! 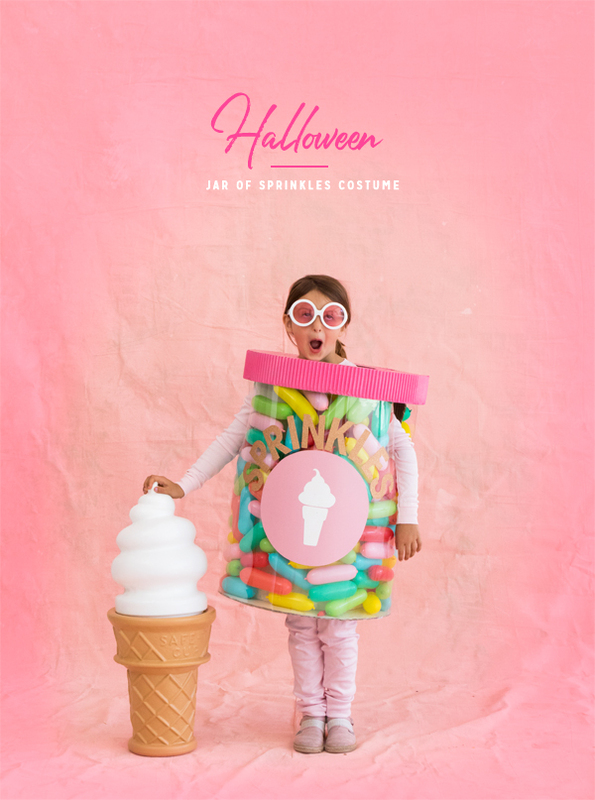 THE CUTEST COSTUME EVER IN THE ENTIRE UNIVERSE!!! :>D!!! This is so very cute and clever! I love it! Hi! What kind of plastic sheet is this? I.e. What term should I ask for at Home Depot or Amazon? Thank you! Super cute! Where do I find canvas webbing? 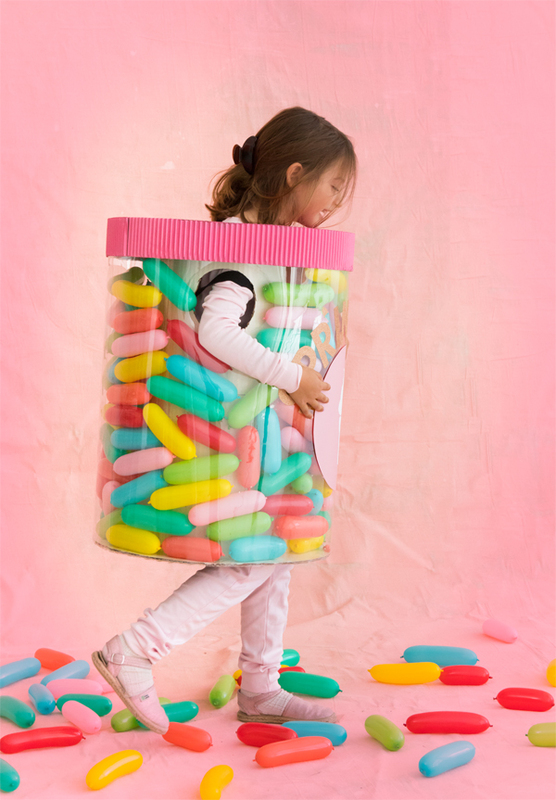 Love this costume idea! Where do I look for canvas webbing? I love what you came up with! Thank you for sharing! The cutest and most clever costume I’ve *ever* seen! You’re just “sprinkled” with creativity!